Kate Huffman’s work in film, TV, and theatre (Fresh Off the Boat, Castle, reasons to be pretty - Geffen Playhouse) has earned her an LA Weekly Theatre Award, an Encore Producers' Award, a Los Angeles Drama Critics' Circle Award nom, a Soaring Solo nom, and a Valley Theatre Award nom. She’s a member of The Road Theatre Company and spent many years with the Elephant Theatre Company. She’s a graduate of the Upright Citizens Brigade (UCB) program and has performed improv and sketch comedy there as well as at ACME Comedy, Second City, San Francisco Sketch Fest, iO Chicago, Austin’s Out of Bounds Comedy Festival, Los Angeles’s Funny Women Festival, the Hollywood Fringe Festival, Comedy Central Stages, and countless other venues and festivals. Her award-winning solo show, I'm Too Fat for This Show, has been seen in cities across the US as well as in Ireland. She hails from Indianapolis, earned her BFA in Acting at the University of Miami, and studied at Steppenwolf West. She takes a lot of prescription pills, but her heart's in the right place! 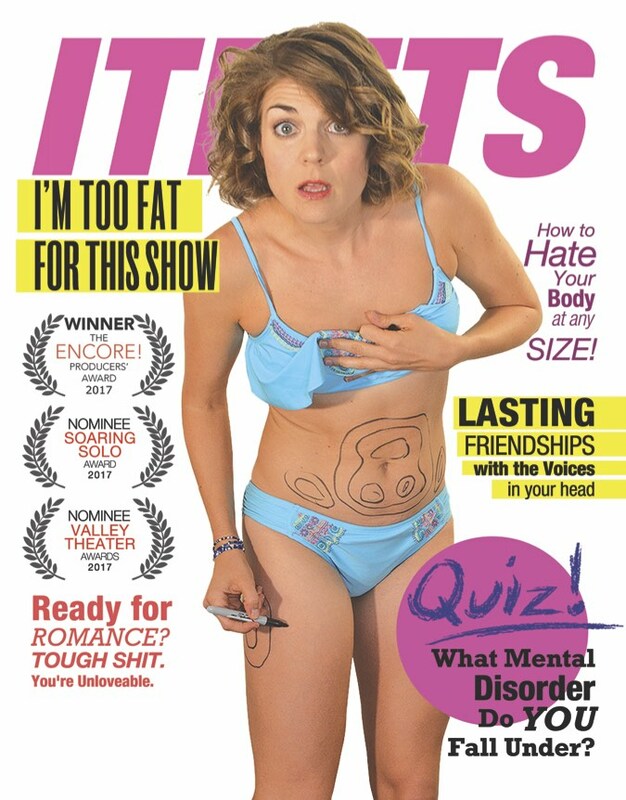 I'm Too Fat for This Show is an award-winning, internationally travelled solo show that’s been changing the conversation on mental health and eating disorders across the globe. Dubbed “one of the most commanding one person shows around today,” this shockingly hilarious, brutally honest piece tells the story of a woman going head to head with her best frenemy of TWENTY YEARS – her personified Eating Disorder. Through 18 characters, multi-media effects, and gut-busting humor, the show defies preconceived notions about these topics and connects performer and audience in the mutually experienced dilemma that is LIFE. A TV special and web series are in the works! We're actively seeking producers, financiers, and collaborators. Contact us here if you're interested in involvement. How did you hear about I'm Too Fat for This Show? Thanks for your interest! Information is coming your way shortly. If you're a venue, theatre, or college interested in booking the show, kindly fill out the form below to be sent more info. Amazing! We’ll be in touch soon to plan this party. Thanks for your interest! Thrilled to announce I’ve been cast in the Road Theatre Company’s upcoming World Premiere Production of Friends With Guns. The play was nominated for a Eugene ONeil Award in 2018 and is truly an exceptional script. Amazing cast and crew involved, as well! Opens March 15th and runs to May 4th. Ticket link! Honored to learn I’ve been nominated for an Indie Series Award for Best Supporting Actress in a Drama for The New 30! We were also nominated as Best Drama Series and Best Ensemble in a Drama. Season 2 is being shot this summer! Check out the series here. A friend once advised me to DM a guy I liked with my number and the words, “Let’s link!” . . . I didn’t . . . Anyway, let’s link.